Jungling? All The Cool Kids Do It, Mom. The long awaited Summoner’s Rift update was patched yesterday for bots and Team Builder for North America. In what is seemingly a bit of competitive spirit, Riot dropped that patch along with Blizzard’s release of World of Warcraft: Warlords of Draenor, and it’s sure to garner a fair bit of attention. 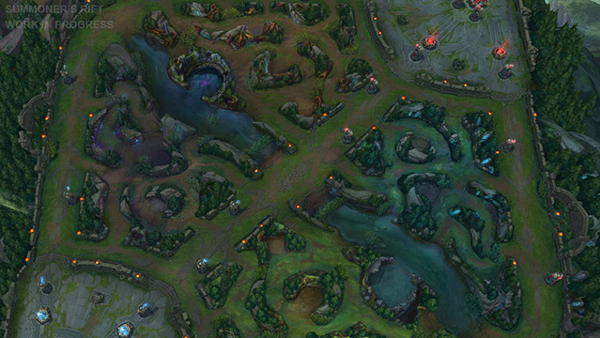 Five years since its release, the Summoner’s Rift map has undergone minor changes mostly centered around trimming edges and smoothing animation. 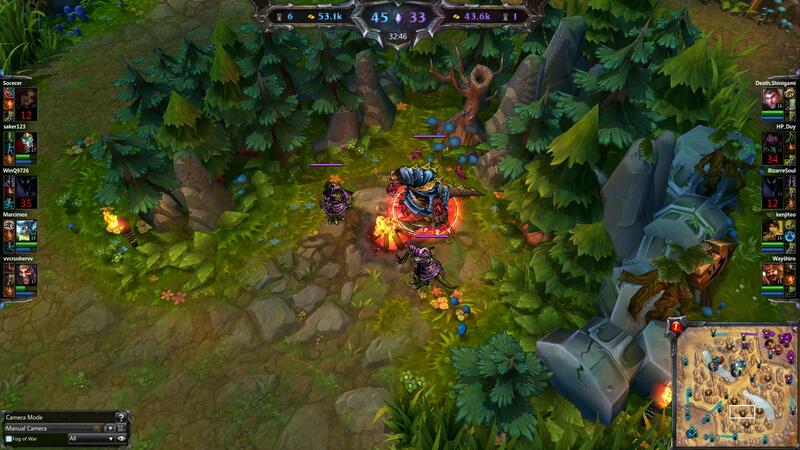 Now for the first time it has received a total make over that underscores the history of Summoner’s Rift. The new map sports a darker but warmly welcomed change of scenery. Most importantly, with this release we get to see a first hand look at the upcoming smite changes and new jungle buff changes on Public Beta Environment. We’ll take a look at who they are, what they do, and how you should handle them. This dude is a 100% brand new addition to the Rift. 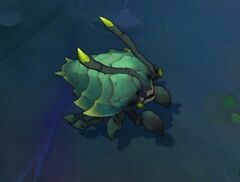 He comes into the game at 2:30 with 450-750 HP (still in the works on PBE) and almost no attack damage. Oddly enough, you don’t really have to fight him. He runs away from you and forces you to risk running into an enemy jungler. He grants no individual buff, but killing the little bugger will open an area of effect that grants your team move-speed should they run through it, along with vision of the area for roughly 1:35 seconds. You can find him wandering around in the rivers of the Rift as opposed to the jungle. I’m not entirely sure that beetles living in water is scientifically accurate, but I’m no scientist. Or a nerd. You boys ain’t nerds are ya? Crimson Raptor and Greater Murk Wolf are Season 5’s versions of a Wraith camp and Wolf Camp respectively. They spawn in the jungle at 1:55 and are quite reminiscent of the neutral objectives that currently reside there. Crimson Raptor is an ugly bird that hangs out with its ugly bird children. Collectively, they have 2100 HP, with Mama Raptor sitting at 1200 and the babes with 300 each. Mama Raptor has 50 damage and .67 attack speed and her kids have 25 damage and .67 attack speed, meaning they can pump out a lot of damage. The average clear time for this buffs sits around 10-12 seconds, meaning the camp will do rough 525+ damage to you. Considering most junglers start with 700-850 HP, this is a huge camp to take solo. You will definitely need a leash. With smite’s changes you now deal 390 true damage at level one, and smiting a camp will give different status effects. 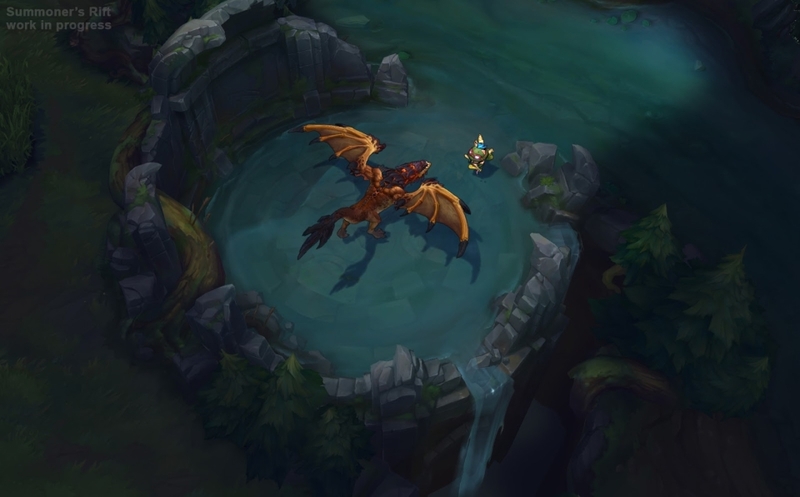 With the Raptors, you gain Razor Sharp, a buff that acts as an oracle and allows you to spot an enemy ward if you walk over it for 60 seconds. Greater Murk Wolf and his little Odd Wolf Gang friends are a bit friendlier, with Greater Murk Wolf sitting at 1320 HP. With 40 attack damage and .63 attack speed he really only does about 240-280 damage. Although I couldn’t find stats for the smaller wolves, it should be safe to assume that they have 300+ HP and deal half as much damage. All in all, this jungle camp deals about 360-400 damage over ten seconds. If you smite this camp, a spirit wolf will run in the jungle and grant vision, and if an enemy walks by it, it will follow them for a limited distance. This buff lasts for about 80 seconds and provides quite a bit of utility to prevent early counter-jungling from your enemy. These fools replace Greater Wight camp found in Blue Buff jungle. These seem to typically be the starting buffs for junglers as they have much more HP and do plenty more damage then other camps. Gromp is a mean and unforgiving camp. If you thought Wight camp was a tough early camp then prepare to be bowled over. This gruesome monster has 1680 HP, 86 attack damage, and .63 attack speed. Solo with smite, it’s an 18 second clear time where he deals 950 damage, much more than the average jungler can handle. With a strong leash and smite he is a bit of a push over but be wary when he comes around again. Smiting this buff grants Gift of the Toadstool for 90 seconds: dealing 39 + (3 × level) magic damage over 3 seconds to enemies that hit you. It’s an effective tool for clearing and has good synergy with tankier jungles that have lower clear times such as Nautilus or Maokai. 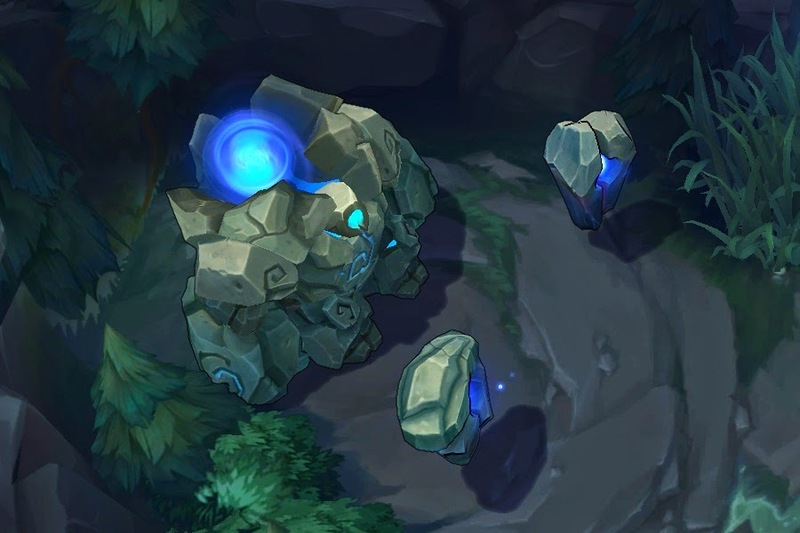 Ancient Krugs, replacing the Big and Little Golems found in Red Buff jungle, are just as boring and lame as his jungle archetype, Big Golem. 1440 HP, 69 damage and .61 attack speed. Throw in the pebble beside him, and you end up taking about 600 damage overall, which is low to start. But, as the game progresses, they definitely scale harder than other camps. Their buff is one of the coolest ones. Aptly named Heavy Hands, this buff allows you to stun a minion or monster every fifth basic attack. For auto attacked based champs like Master Yi and Udyr, this stat will most certainly give them an upper-edge on clearing. Why is he standing IN the fire? Who designed this!? Red buff / Elder Lizard has been updated into a beastly jungle monster known as the Red Brambleback who is much larger than the previous Elder Lizard whom he replaces. He spawns at 1:55 with the rest of the bunch. Twice as cute, twice as deadly. His little comrades are known as Cinderlings and they seem to be even weaker than the little lizards before them! He’s a grumpy looking fellow but not actually the biggest threat you face! Clocked in at 1800 HP with 76 attack damage and .60 attack speed, the camp will probably deal upwards of 760 damage. Of course if you are leashed another camp or two, you’ll have a level advantage and he won’t faze you. Unless you are bad. Then you will die to him and every one will mock you for it. Smiting this bad boy returns a large portion of your HP back to you over 2 seconds. There aren’t exact details, but I personally assume it will be 40% of your max HP. And finally a familiar face returns in the form of Red Buff! The true damage burn that slows is the reward for slaying this dork squad. When looking for little lizards, check near large rocks! Blue Buff / Ancient Golem has been drastically changed in my opinion. Before, he was a Geodude. Now? He’s like the Mega-Evolution of Golem! He awakes from a slumber that he clearly did not want to wake from, so be careful when you mess with him. Those little guys are called Sentries and in a century they might just be as big as their dad. I think that’s their dad. Let’s not go there. To be completely honest, Ol’ Senty here ain’t nothing to be afraid of. Beating him is like shooting fish in a barrel. Spawning at 1:55, he’s got 2000HP but only 76 attack damage, and his attack speed is a dismal .49. He’ll knock you around a bit, but you should only take about 400+ damage. If you take any more than that, or get stuck on this buff, maybe you should try a different role. Or a different game. Maybe go outside or something. Smiting El Azul will grant the Smiter a sweet mana restore rumored to be around 40%, along with the standard Blue Buff to who ever gives the killing blow. If you thought Shyvanna had the ultimate skin, wait until you see new dragon. I’m pretty sure this guy killed me in Monster Hunter like four times. Now if there was ever anything in the jungle to watch out for, it’s gotta be the new dragon. Spawning at 2:30, Dragon has 5012 HP, 230 damage and .30 attack speed. It’s no joke, so make sure you got some friends when you try and take this one down. Instead of global gold and experience, Dragon gives a stacking bonus known as Dragonslayer for every culminating take down. (5 Stacks) Aspect of the Dragon: Triples all other bonuses and grants Wyrmfire: damaging enemies burns them for 50 true damage per second for 5 seconds. Lasts 180 seconds. Slaying Dragon again renews the effect. These are the tentative buffs, according to PBE Jungle updates. The dragon’s jungle nesting ground was also given a sick update with surrounding waterfall that really sets the mood. After playing the map a few times, I noticed it can be confusing warding the Dragon’s Pit from the blue side jungle Tri-Bush, so just go ahead and face-check it because your teammates will every time. Every. Time. Before he looked like a B-studio prop at best. 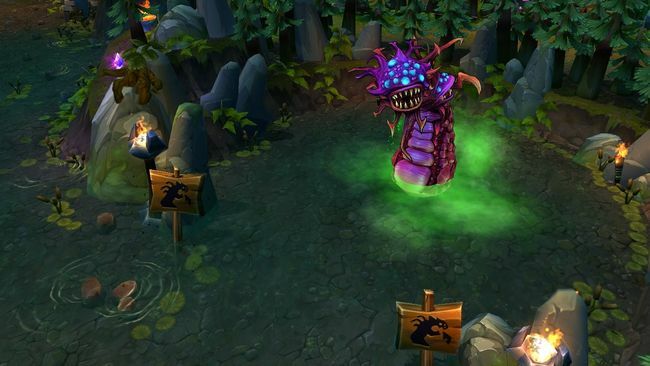 New Baron Nashor is a mean, vicious, and deadly buff and the biggest highlight for those jungling. Spawning at 15:00, Baron has 10,852 HP with 430 damage and .75 attack speed at first rank. He scales harder as time go on, gaining thousands more health. Baron’s three main attacks are a vile bile shot from his main head, a knockup from under ground that is hard to predict, and a massive area of effect poison burn that can fill an entire side of the pit. Baron is no joke. Melee Minions: Gain 80% damage reduction from almost all damage types. Siege Minions: Gain massive increases to range – such that they outrange towers. Their attacks are 50% slower but are AoE and deal 4x damage to towers. While siege comps seem to be taking a slight hit, the minion buffs are nothing to scoff out. This increases siege potential, although siege comps will no longer be able to push forever with massive regeneration buffs. It will definitely be interesting to see if this changes meta comps in any ways. Although new jungling paths for Season 5 are still in the works, jungling looks to be completely revamped along with the new designs. A notable feature on all buffs is an HP bar with numbers displayed for all to see. This makes buffs even riskier and easier to contest. While the machete build is still in works, there are supposedly four different routes a jungler can take to maximize his champ’s play style. 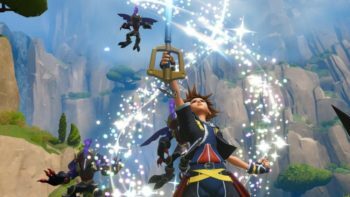 There are four enchantments that look to be made for Tanks, Mages, AD Casters, and Auto-Attack reliant Junglers. This is a huge boost to the diversity of the role compared to previous seasons. Although Season 4 made the biggest advancements for new junglers, the role was still limited. Junglers would miss out on certain stats due to an item slot being held by a jungle item, but these changes seem to be based around flexibility rather than strict purposes. After review of jungle pathings by famous players and streamers such as TheOddOne, Pants Are Dragon, and RedMercy, it seems that the best pathing is to start a buff as before, take two smaller camps, and then the next buff. 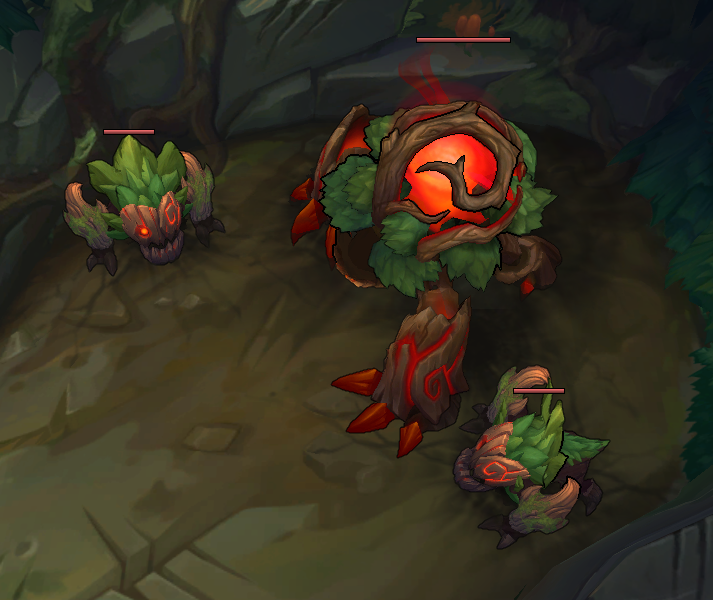 Alternatively, some Blue Buff starting jungles can take the Gromp for its special buff, easy clear, take wolves, and then blue before moving onto the other side of the jungle. There are definitely going to be many different ways to play this jungle. As preseason nears an end, it becomes less likely to see any of these stats drastically change. Season 5 is on it’s way, and it is going to shake up the meta. So go on and get out there, see the map for yourself. Season 5 is coming faster than Hecarim with homeguards so you better get ready for the changes. Welcome to the jungle, Summoners. Knock ’em dead.